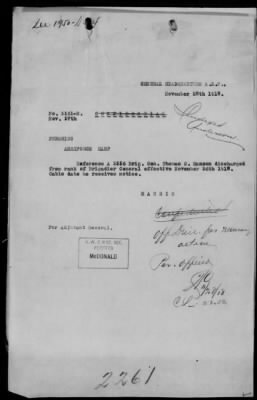 This publication includes all cablegrams exchanged between the General Headquarters, American Expeditionary Forces (abbreviated here as AEF HQ) and the War Department during World War I, with the exception of the series listing names of casualties sustained by the AEF. These are file copies from the Cable Division of the Adjutant General's Office, arranged by series and then chronologically. They contain nine series of cablegrams and many contain a number of distinctive markings and marginal notes.